The cornerstone for what would eventually become CrossWalk Center was set years ago in the heart of a man whose career and life experiences exposed him to the crying need for faith-based mentoring inside, and aftercare counseling and discipleship outside the prison walls. He saw first-hand the dire need for stability for the formerly incarcerated and their families through meeting their day-to-day practical needs. Pastor Joey Gentempo established His Father’s Heart Ministries in 2001 after having served in the mission field in England, then later as a Harris County Civilian Chaplain, and as Program Director for the Prison Fellowship IFI Program at the Carol Vance Unit outside Sugarland, Texas. He witnessed individuals remained broken-hearted even after having had a real encounter with God inside prison walls. He established HFHM to break the cycle of destructive behavior, reaching those at risk for re-arrest, drug abuse, spousal abuse and other addictions. Men, women and their families began to come from the four corners of the Houston metro-plex region to openly and honestly address deep-seated issues of the heart that resulted, when not dealt with and healed, in behaviors that sometimes terminated their freedom. While spiritual needs were being met through the ministry, Gentempo recognized that the tangible barriers to successful re-entry were often a challenge due to the numbers and wide variety of services available from across the region being geographically dispersed. He observed that it was physically hard for recently released citizens to take advantage of many services due to their limited access to available transportation. That’s when he began to speak openly in churches across the Gulf Coast region about the need to have a location where both spiritual and practical needs and services could be found under one roof. 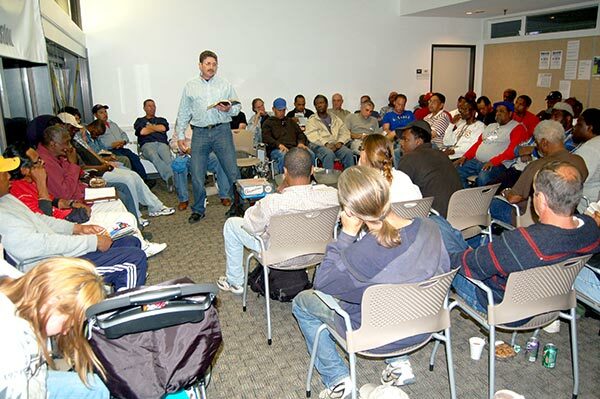 The vision for a facility that would serve as a centralized hub for Houston re-entry was born out of the pure unconditional love of Pastor Joey Gentempo for the marginalized in our city specifically, and his God-birthed burden for the needs of returning citizens and their families especially. Beginning in the fall of 2014, a regional Development Team comprised of members and volunteers from Saint Andrew’s Presbyterian Church Missions Committee, First Presbyterian, Grace and WoodsEdge churches, and His Father’s Heart Ministries, met to begin building upon what Pastor Joey had envisioned. The Development Team members, 10 in total, from diverse backgrounds, experiences, theologies and perspectives, began researching and investigating, framing, hashing out, discussing and frankly arguing at times in love, about what the new regional re-entry hub could be and what, with God’s grace, it could become. That group of dedicated individuals built a sound foundation for the re-entry hub on that single, solid visionary cornerstone placed by Pastor Joey Gentempo. In June 2016 CrossWalk Center was birthed and by August it had found its home on North Main Street. 2014 to 2016 Development team members: Dave Rettew, Colleen Kimball, Larry and Tracy Gelbaugh, Fred Robertson, Cody Nath, Graham Horton, Kathy Vosburg and Pastor Joey Gentempo. CrossWalk Center's mission is to serve the Kingdom of God by unconditionally welcoming, serving and mentoring returning citizens, giving them hope and a future. CrossWalk Center's vision is that not one citizen will return to a life of incarceration due to a lack of access to mentoring, community support, love and a transformed life through God and Jesus Christ, His Son.